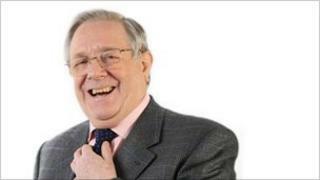 BBC WM presenter Ed Doolan will only present one consumer affairs programme a week from the autumn. The Australian-born broadcaster joined the station in 1982 and was the first local radio presenter to be inducted into the Hall of Fame in 2004. He currently presents five weekday shows but said he could no longer "continue the current work schedule". The 69-year-old will still present the show on Fridays with other presenters working the rest of the week. "With the milestone of seven zero looming ahead there are some decisions that need to be made," Doolan said. "I am not retiring, resigning or calling it a day, but I simply cannot continue the current work schedule of seven days a week - some live, some not - as it is unfair to those of you who have to prop me up." He currently presents a spin-off show on Sundays called "The Other Side Of" but will present a new "Sunday Funday" show at a different time from the autumn. Doolan began his broadcasting career in Cologne at the German World Service in 1970. He then moved to Birmingham in 1974 and joined BBC WM from a commercial radio station in 1982. He has interviewed numerous world leaders including Nelson Mandela and every prime minister since Harold Macmillan, with the exception only of Labour's Harold Wilson.